After a sudden unexplained disappearance, Thomas Charles comes back into Cat Carlisle’s life with the suggestion she leaves London – and the threat of bombs – to move to back her childhood village in Cumberland. The Silent Woman was set in pre World War two London, but now we’ve moved to the countryside in 1940, and the war is raging in Europe. Britain is preparing for invasion and bombs, and children are being transported to the countryside to get away from the possible terror. I love the descriptions of the British countryside in this book! I really just wanted to book a holiday and get going right away! Thomas has kept her great descriptions from the first book and brought them over to this one. Her descriptions pull me in from the very first page and make the reader actively engage its fantasy with the story. I just love it! 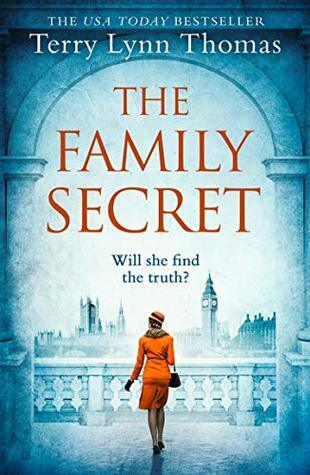 The Family Secret also has a mystery to it, like The Silent Woman had, and I have to say it was quite difficult to connect the dots and figure out who was the bad person. The storyline was very clever and there was a whole lot of small stories going on at once, but it didn’t get complicated as a result, which I think is very well done! Often when an author decides to have a lot of small stories in the storyline it’s easy for them to get tangled up and confusing. This is not the kind of Stephen King mystery, it’s more on the Criminal Inspector Foyle (lovely British TV-series set in Hastings during the war) side of the mystery scale. Some people might call it a nice kind of mystery, and I don’t disagree. It won’t keep you up at night so if you’re looking to be introduced to the mystery genre, then this series is a good place to start in my opinion. Good language, easy reads, and good plots! I found it very interesting to read about gender roles back in those times. During the war, a lot of women became active in the work field and many had their first job ever. We see this in the movies, but in the countryside, even though this book is set very early in the war, I got the impression that people held onto the stereotypes accordingly to what society expected of them. We see this especially in the character named Caramona and her mother. Almost every adolescent have a little rebellious period during their teens, but I almost got the impression that this gets increased during periods of war. Caramona and her mother reminded me of my father and me at times. We have had our rows over the years, haha. Strongwilled and stubborn people both of us. It is always fun when you can relate to characters! This story has a lot of great aspects to it, and I really recommend that you give this series a go! If you’re not that into historical fiction then read it if you like a nice mystery. Everybody can read this book, well, maybe not children, but other than that it’s suitable for most people. Pssst! Rumour has it that there is a third book to come! One excited book blogger over here! Thank you! 😃 Have you read the books? ?